Jun. 10 /CSRwire/ - BENNINGTON, NH - June 10, 2008 - Monadnock Paper Mills, Inc. today announced the release of the third edition of its renowned instructional how-to guide for creating more sustainable print materials. With over 100,000 copies already in use, the publication, A Field Guide: Eco-Friendly, Efficient and Effective Print is a single resource that objectively details alternative design decisions that impact sustainability without sacrificing style or effectiveness. The guide presents information from choosing paper to recycling the finished piece including paper types, paper contents, chemical labeling, sizing to reduce paper waste, inks and coatings, finishing techniques, binding, printing processes and the use of environmental logos. New information in the third edition of A Field Guide includes a full chapter dedicated to eco marketing, eco claims and the topic of "greenwashing", as well as new information on inks and finishing. The new edition is printed on Monadnock Astrolite PC 100(R), an uncoated paper with 100% post-consumer fiber, that is process chlorine-free and archival quality. Like all Monadnock Printing and Packaging Papers, Astrolite PC 100 is made with 100% renewable electrical energy and is manufactured carbon neutral. 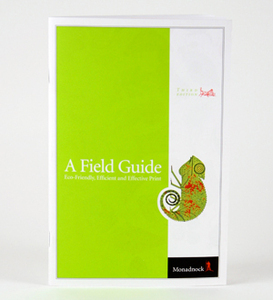 "We are very pleased that our Field Guide has become a leading industry resource for furthering sustainable decision making in the field of graphic arts" said Richard Verney, Chairman and CEO of Monadnock Paper Mills "The Third Edition continues Monadnock's commitment to provide graphics professionals with the tools and knowledge to impact sustainability throughout the design and production processes". Part of the guide's popularity with users is that it doesn't tell them what to do nor does it advocate that they follow every suggestion. Rather, it provides detailed information on decisions that impact sustainability in the design processes and offers environmentally preferable choices that can be made at each stage. Designed for Monadnock by Signaltree Marketing and Advertising, A Field Guide is inspired by nature field guides and features the whimsical nature illustrations of the late Charley Harper. The guide is available in PDF format and printed copies may be ordered through Monadnock's website at www.mpm.com. Monadnock Paper Mills manufactures all of its premium Graphic Arts Printing and Packaging Papers Carbon Neutral using 100% Renewable Electricity. Monadnock is a family-owned company that is ISO 9001:2000, ISO 14001:2004 and Forest Stewardship Council (FSC) certified SW-COC-1160, assuring consistency in paper performance through craftsmanship, technology, and responsible environmental practices.